RANDALL’S ISLAND — The Chickens have returned. A month after someone drowned eight chickens at the Urban Farm on Randall’s Island, five chicks moved into a new high-security coop in their place. 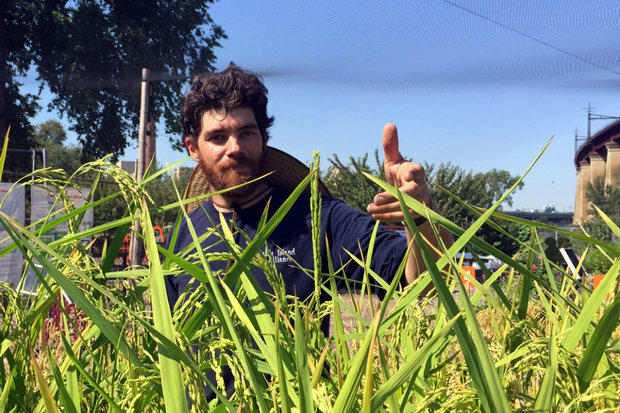 “It was pretty hard on the program, pretty hard on us,” said Nick Storrs, the Urban Farm manager. “But we very quickly knew that we wanted more chickens to keep chickens in the education program." On Thursday, the 5-week-old chicks, who had previously spent nights indoors, slept in the new coop for the first time, he added. 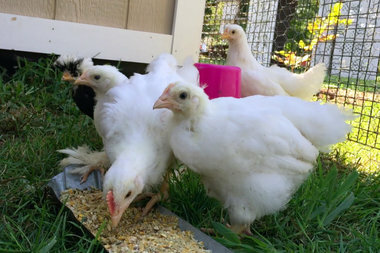 Originally, the Randall’s Island Park Alliance, which manages the farm, wanted to get loaner chickens but they ultimately decided to get newborn chicks from the website mypetchicken.com. School children will start visiting the farm next month. The chickens are headliners with children, Storrs said. "People react really strongly to the chickens," Storrs said. "It’s one of the reasons we really like them. They can have a really personal relationship with the chickens in a way they can’t with an eggplant." During the science classes, students learn about food diversity and are encouraged to eat “rainbow salads” that have a variety of ingredients and nutrients. Students get to harvest food, cook lunch, and eat it together, he added. The chickens help illustrate diversity within one food item because there are three types of breeds in the farm. Some of them are better egg-layers and others produce more tender meat. At the supermarket, people may think everything comes from the same bird, Storrs said. They also grow 10 different types of carrots and 10 types of rice at the farm. Starting Thursday, the chickens will live outside at the Urban Farm. People are welcome to visit them anytime the farm is open and on special events like the upcoming Fall Harvest Festival on Oct. 3. For the chickens, moving outside is almost like a rite of passage. To ensure there is no repeat of the July 31 chicken murders, the new coop has safety features like a steel beam blocking the door, two metal locks and window grates. There have not been any arrests for the chicken murders.